I am OBSESSED with this rug. It is magically soft and I love the ombre! I just furnished an entire house and this rug is one of my all time favorite purchases. 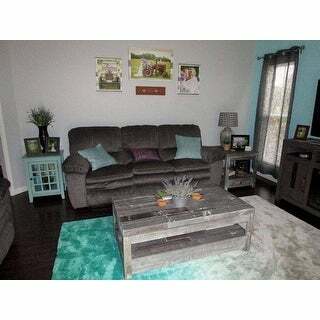 This rug was perfect for my living room in which one wall is painted aqua. Would HIGHLY recommend! 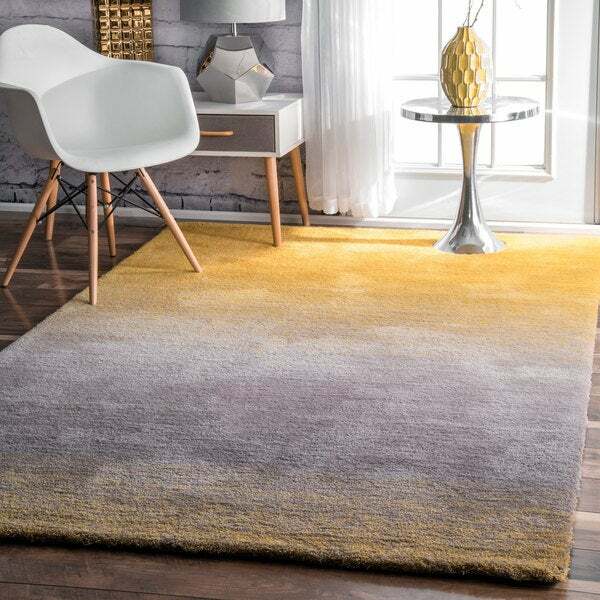 Designed with contemporary style, this beautiful Padborg area rug from Carson Carrington will refresh the look of your room. The timeless rug features an abstract ombre pattern to give the handmade piece a charming appeal. The durable polyester and synthetic fiber construction ensures that this attractive rug will adorn your decor for years to come. This is my 2nd NuLOOM brand rug. I have a yellow to grey color fade rug, and now this blue to yellow color fade rug, both in size 5'x8'. I use them in two bedrooms. I like the color fade style - it's colorful and pleasing to look at, but not overly busy looking like some patterns, and so it goes easily with the room's decor. This blue to yellow fade rug is lovely and the colors are rich and bright. Looks just like the pic. It's very soft and feels really nice with bare feet. The length of the loom is about an inch long. So it's not a super long shag style, but has just a little length compared to a loop style rug. Easy to vacuum and clean. The quality seems pretty good so far, no issues on either of my NuLOOM rugs in the past couple months I've owned them, and we walk on them all the time, plus we have a dog &amp; cat. Fast and securely packaged shipping from Overstock also. Would recommend! Colors were perfect very accurate description. I live on the river and it's not unusual for my basement to be filled with one to two feet of water at high tide. This makes the floors real cold during the winter. This rug is so thick and soft, kinda feels like you're walking on marshmallows, that I"m fairly certain my feet won't be so cold this winter. Oh and by the way the color is pretty darn close to the picture on their web sight. I'm loving it. My daughter absolutely loves this rug!! It is extremely soft and the colors are just as shown in picture!! I would definitely recommend this rug!! 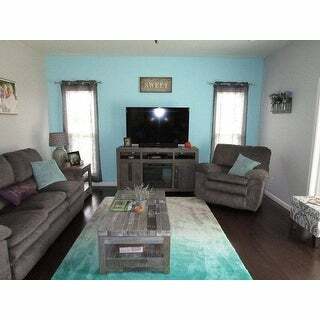 This runner rug is really soft and true to the colors displayed in the pictures - I love this rug and highly recommend it! I do recommend a rug pad beneath to prevent the rug from moving. This area rug Relly gives a nice Look! 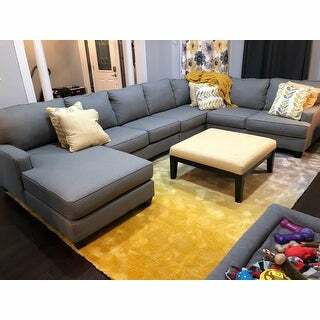 I received my yellow/gray area rug today. It really gives my living room some color and pop! It seems to be of quality composition and is indeed soft and plush. I do recommend a gripper pad to use under it. I"m sure it will give me many compliments.I received it promptly, and so far am very satisfied.. I could not find anything like this locally. 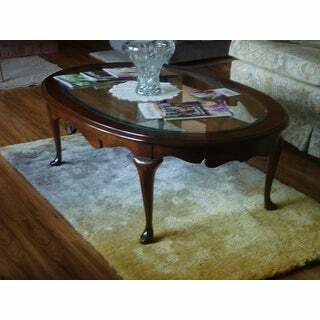 I absolutely love this rug, it is durable, looks more expensive than it was and is an eye catcher in the room. Excellent quality rug! Helped to sell my house the colors were so striking! Absolutely pleased with this runner. It was exactly what I needed to add that pop to my guest room. In addition, the pile and feel of this runner under your feet is terrific. Would recommend in any size. Quality fantastic........turquoise color way off! If you're looking for turquoise, keep looking! 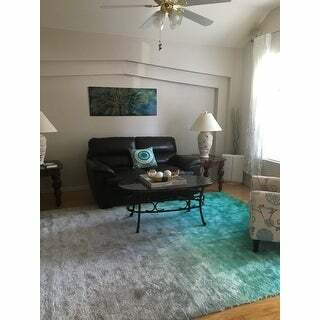 This rug is very plush and comfortable, but the green color (rather than the turquoise pictured) is awful and the grey is actually more of a beige. The outgassing from the chemicals is overpowering. Customer service told me the color was off because of my computer monitor. Next excuse was the dye lot. In no universe would that bright green color I received ever be called turquoise. I sent it back today. $*** down the drain for return shipping of a 4x6. Smelled for months, wasn’t even square as in the rug was wonky, and the color wasn’t as pictured. The whit was like a sad shade of want to be grey...ugh total nightmare. I wanted to return it but my husband liked how soft it was. OMG!!! This rug is everything. It is sooooo soft. The colors are very vivid. I wish they had the colors I need for my living room. There was a chemical smell but it dissipated. Hold up beautifully and color blends nicely with our floor! Color is more green. Rug is SO soft and amazing! 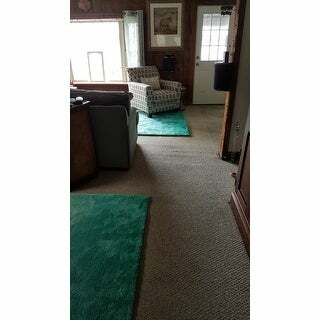 As other reviews described, the rug is more of a teal, green color that fades to a mint then to a soft gray/tan color. It's very soft and plush. It is excellent quality and very beautiful. I bought it for my daughter's room. She has a mint color theme going and it fits in perfectly. I bought this for my 12 year old granddaughter when she redecorated her bedroom. Very soft and nicer than the picture. It is her favorite! I looooooove my new rug!!! It goes oh so well with my living room colors & it is really really soft!! Idk how long I looked for the perfect rug to match my living room & boom overstock came thru with the exact 2 colors I needed & they were together already!! Now my girls will get one for their room. The rug was pretty well made and extremely soft. I haven't noticed much shedding with it either. Unfortunately, there colors aren't anything like what is depicted in the picture. It was supposed to be aqua and gray but it's actually a very odd green color and beige. It doesn't match anything in my home and I don't want to have to pay a fortune to send it back. If you're looking for a very soft and durable rug, then this one is for you. 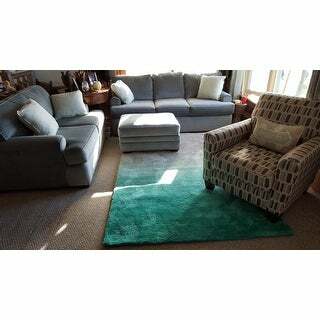 If you're looking for an ombre aqua and gray rug, look elsewhere; you will be disappointed. Sooo soft! I love it!!!!!! I didn’t like the carpet. Using it as I opened it. I bought this 2 years ago and then buy it again this year, can totally feel the quality is not as good as before and the hair is not that dense and thick. I like the color , the shag depth and the gradient of color and goes very well in my family room with the other colors that are in the room. It is so plush, love the feel of it. Color is perfect. "Any idea when the Navy/yellow rug in a 6x9 or 7x9 will be back in stock?" "Can a vacuum with a beater bar (I have an Orek) be used to clean this rug?" "Does the rug show foot prints and how much does it shed, if at all? Thank you!" This rug can show foot prints lightly. Shedding may occur in new hand tufted rugs in the beginning. "Can you vacuum this rug?" Yes, you can vacuum with low-powered vacuum cleaner. Yes, you can use any vacuum it doesn't hurt the shag. "Is this rug available in 5x8? I cannot seem to get that size to show in the cart." This rug is flame retardant and latex free. Monae Navy & Yellow Abstract Area Rug - 5'3" x 7'6"
Carson Carrington Karlskrona Distressed Ikat Yellow/ Grey Rug - 6'7" x 9'1"